Despite the victory delusions of Confederate President Jefferson Davis, the fortunes of the South deteriorated dramatically in March 1865. Gen. Robert E. Lee’s Army of Northern Virginia was now reduced to 55,000 men, hunkered down defending Petersburg and shielding the southern capital of Richmond as it endured the siege of Gen. Ulysses S. Grant’s army of 120,000. Having lost hope in their cause, Lee’s men were hungry, despondent, and now deserting in increasing numbers. By March 24, Gen. William T. Sherman had completed the second leg of his devastating march through the deep south, pulverizing anything of value and punishing the people in an effort to sap the last vestiges of their will to endure. The army reserved its harshest treatment for South Carolina, the first state to secede from the Union. He now moved north to assist Grant. After nine months of siege, Grant sensed Lee’s vulnerability and on April 2 ordered a general offensive along the entire front. On this pleasant spring Sunday, President Davis attended church. A messenger suddenly came to him with a telegram. It was from Gen. Lee: Richmond must be evacuated. Davis hurried from the church, signaling the congregation with his ashen face the ill tidings. 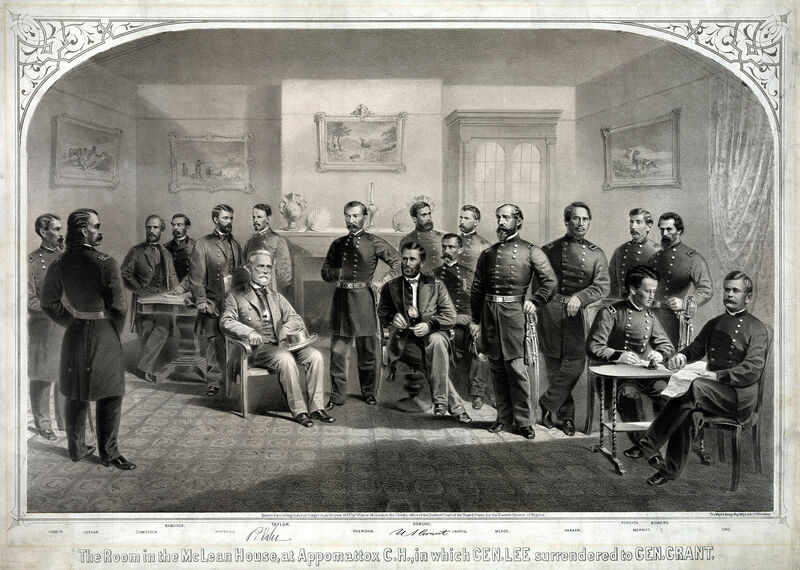 There in McLean’s living room, the two generals presented quite a contrast: Lee, taller, resplendent in impeccable, full-dress uniform, with sash and engraved sword; Grant with muddied trousers and muddy boats, wearing a simple soldier’s blouse, apologizing for his shabby appearance. The West Point graduates talked informally for a while. Lee, having graduated 14 years before Grant, said he did not remember meeting Grant during the Mexican-American War. Lee eventually directed their conversation to the matters at hand. This entry was posted in Uncategorized and tagged 1865, American Civil War, Appomattox, April 9, Civil War, End of Civil War, Fred Zilian, Lee's surrender, Robert E. Lee, Ulysses S. Grant. Bookmark the permalink.